One of the trips I fished this past week was a party of 8. The weather was cold and basically miserable, however our hearty group of fishermen displayed the patience needed . We found a good looking place in 55 ft. water, anchored the boat and fished from 8:30-11:30am. 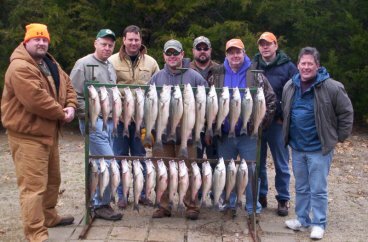 The fishing party finished the time off catching a good looking limit of good sized Lake Texoma stripers. 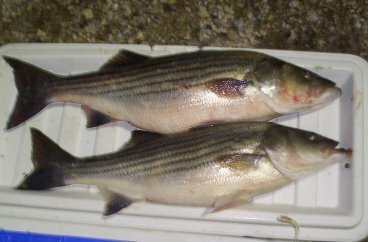 For you bait fishermen, right now we can catch all the Threadfin shad we want with no problem at all. The problem with Threadfins at this time of year is keeping them alive long enough to be able to use them. I have been working hard to find Gizzard Shad as they seem to handle to cold weather better, live longer after you net them. The Fishing pattern we have been fishing seems to have the fish holding in the 55' to 70 ft' water and occasionally in the 35' to 45' water mainly west of Hiport Marina. Other guides I have spoken with report they have been catching fish from The Rail Road Bridge and up as far as Little Glasses. They report the fish are also in the deep water at these locations. The Evening bite is still producing more and better quality fish this week. The birds are laying low and not working much at all. Keep your eyes on them and if you see them start up use a one ounce Sassy Shad in Glow or Chartruesse color. Remember to work the lure back to the boat slooooowly.